Run to Finish once again challenged her readers to get up and move! This is not the first time I've done a virtual race (I should start blogging about the annual 26.2k race that I run with forum-ites, which I've done twice already), but this is my first attempt at reporting on one. 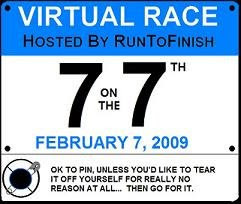 Anyway, this "event" was called 7 on the 7th, which basically mandated running 7 miles or more on February 7th. However, on the 7th, which was a Saturday, I was too tired from the week, it was raining, and I had a tea party to attend, so I would try my 7 on the 8th. Come Sunday, I started off during the early 7 am hour to do my run, and about half a mile later, it started to rain. I thought I'd try to get through it, but it only got worse and stopped at 3. Normally, I would have no problem running through the rain, but since I live at home now, I didn't want my mom to... well, be a mom and say stuff like getting sick in the rain, or whatever other myths (add on the Asian ones as well). On Monday, although rainy still, I had a stroke of good luck, as my evening class was canceled. I went to school anyway to attend a community meeting and work on my thesis data. During the community meeting, I ate three large potato wedges, which is SO not clean, but oh well. Then I headed over to run some errands and go to the gym. I saw "The Ukrainian" running in the crowded gym. This was around 5:30 pm. He was just about finished up, so I took his treadmill, which was the only one with a fan (thank goodness, 'cuz I needed it!!). I got on there just hoping to get my 7 done, but it turned out to be a much longer run than that. And I only had some unsweetened blueberry green tea in my water bottle, too. Is anyone else disturbed that I ran my 13.1 miles faster than at my race last weekend? How did I let things get "too far" with this supposed 7-miler? The "brilliant" idea struck me as I was running, as I knew I should get a 15-, 17-, and 20-miler in before next month's marathon. On a final note, I will say that I am sorry for my treadmill (yes, it's my favorite one now that my former favorite one become squeaky). "The Ukrainian" and I tortured the poor thing (a total of 25 miles with pretty much no break). Wow, you did the 7 on 7th! and then some. Good job! Wow, that's some miles!! nice job.